Student protesters in Belgrade (June 1968). Photo by: Vladimir Cervenka. We publish here the second part of our interview with Dragomir Olujić (Oluja) on the “student revolt” of 1968 in Yugoslavia, in which Oluja took part as a student in Belgrade. In the first part of the interview we discussed the international situation, the struggles of the workers and the youth around the world, struggles against the Vietnam War, the wars of national liberation in the so-called ‘Third World,’ dissident movements in the ‘socialist camp,’ etc. All of this influenced the situation in Yugoslavia, but Yugoslav society was also undergoing its own political, economic, and societal changes as well, creating internal contradictions that prepared the ground for dissatisfaction and revolt. In this second part of the interview we asked Oluja to talk about the demands of the youth in Belgrade, their relationships and links with workers and other social sectors, the intellectual influences of the students, and their attitudes towards the regime and Tito’s figure. This interview was conducted by Philippe Alcoy and translated from Serbian by Milica Popović. Were the claims of the students only centered on matters of education and on their specific living conditions or were they wider than that? What were their links to other sectors of the society, especially with the working class? Not at all! After the conflict between the students from Studenjakand the police on the 2nd of June – all-night institutional and informal discussions at the University of Belgrade (immediately renamed the Red University Karl Marx) proclaimed a seven-day strike and university occupation; action councils were formed at the level of faculties and the whole university; there were debates, discussions, many different activities were organized, mostly cultural and it they lasted around the clock… A type of ‘Free Republic’ was created. All necessary “services” – from food provisioning, information, public debates, to security and “defense” – worked on the principle of self-management. We even had our own anthem. The student’s demands, expressed in 3+4 demands, the Action Program, and ‘the Resolution of the Students of the University of Belgrade,’ as well as the documents produced by certain faculties, expressed primarily social demands: ‘Enough with corruption,’ ‘Down with the red bourgeoisie,’ ‘Against the transformation of social property into shareholding,’ ‘For the abolition of social differences,’ ‘Destroy privileges,’ ‘For integral self-management,’ ‘Efficient unemployment solutions,’ ‘Students-Workers’… – these were only some of the slogans of the ‘student revolution.’ Special place was given to the demands for a ‘free media.’ Calls for punishing and removing those responsible for violence against the students… In the end, we also demanded better conditions for universities and student life, and especially better access to higher education for workers’ children. We had support from some important political institutions, thanks to the honorable people who led them, like professor Žarko Bulajić from the University Committee of the League of Communists of Yugoslavia at the University of Belgrade, Đuro Kovačević, Vladimir Gligorov, and Petar Ignjatović from the Student Alliance, but also individuals from the state apparatus like Svetozar Vukmanović Tempo and General Gojko Nikoliš (we used his car to distribute the newspaper Studentin Zagreb and Ljubljana)… We also had the “understanding” of the circles of future ‘liberals’ and parts of the party intelligentsia! The central events were taking place at the Faculty of Philosophy, in the most beautiful courtyard in the world, under linden trees, where today one finds the building of the University’s Rectorate. We occupied the Faculty from the ‘inside,’ and there were two outer circles of the ‘occupation’ – one was a police cordon, and the second one was composed of citizens who were coming to see and hear what was going on and how the protest was advancing! We immediately established a convention – led excellently by Professor Dragoljub Mićunović! This was a place where everyone could speak, and by the reaction of those present – applause or whistles – find out where their speech stood. Steva Žigon performed Robespierre’s monologue (about the “marquis and princes of the revolution” and the revolution as a “despotism of freedom”) from Georg Buchner’s Danton’s Deathand received such ovations, like he never did, nor before nor after. Police blocking path of student demonstrators in Belgrade (June 1968). For example, the workers of the Zemun-based factory “Teleoptik,” through their union, contributed 500,000 dinars – which was the amount of approximately fifty student loans – and then every day with an additional 5,000 dinars; the workers of factory “Velebit” did it informally, through voluntary contributions… The citizens as well! The regime immediately responded through demagogy and political maneuvers (they knew that “workers’ issues” were a real problem). The Federal Parliament on the 4th of June through an urgent procedure adopted two laws: the Law on Personal Income, which doubled the minimum wage, and the Law on Trainees, by which companies and institutions were obliged to admit a certain number of young graduates from high schools and/or universities. The regime responded with a media blockade and media propaganda about the students, but also with repression: they adopted a law restricting the right to assembly, which is still formally in place because it was never withdrawn. In companies and institutions there were ‘workers’ guards,’ consisting mostly of clerks and people leading the departments of ‘defense and people’s protection’ (ONO). These guards forcibly prevented contact between students and workers. Milan Nikolić and his team, who were responsible for contacts the workers, were always stopped at the gates of enterprises and did not manage to institutionalize cooperation. Yet, workers and employees gave us their support and showed us that they were with us, either ‘morally’ by coming to the faculties, either materially by making contributions like the workers at Teleoptik and Velebit. After Tito’s speech, at most faculties people danced the Kozaračko kolo– at the Faculty of Law it was started by Vuk Drašković. They accepted Tito’s words, and went back to business as usual. At the Faculty of Philosophy and some other faculties and academies, Tito’s speech did not ‘pass.’ There, the debates and different sorts of protests continued. At the Faculty of Philosophy for three days there was silence, a perplexed mood, and about for another two, three weeks the gatherings continued. And it was not the end! The student struggles continued until the beginning of 1975 and the exclusion of 8 professors from the Faculty. They continued afterwards, through the dissident Open University and the support given to workers’ strikes, and after the Helsinki Act in 1975 by supporting human rights struggles and the creation of new social movements. Which were the intellectual influences among the youth that influenced and/or preceded the revolt? The main intellectual influences came from the group of professors of philosophy and sociology gathered around the Korčula Summer School and the journal Praxis(and Filozofija). The most important ones were Rudi Supek, Gajo Petrović, Mihailo Marković, Milan Kangrga, Predrag Vranicki, Danko Grlić, Ljubomir Tadić, Svetozar Stojanović, Miladin Životić, Dragoljub Mićunović, Vanja Sutlić… – in them we found inspiration, from them we learned how to think, from them we got enormous knowledge, through them we got a window onto the world, our first contacts with the world. To what extent were the student mobilizations against the regime, the party and/or Tito himself? We were against the regime but not against socialism – we did not demand more socialism but a radically different socialism! We were against the party, because, to put it mildly, it did not behave in accordance to its program. We were against Tito, because he was leading a hybrid system, a system encompassing elements of direct democracy at the level of enterprises/factories/institutions and elements of representative democracy at the higher levels. This hybrid system was as a whole led by the party elite and Tito, often through ‘a surplus of violence’ and/or Tito’s direct interventions. We wanted a society organized, both horizontally and vertically, on the principle of workers’ councils! Talking about Tito as an unquestionable authority, towards whom we had to define our positions – I have to explain two ‘phenomena’! First, you maybe noticed, on our posters Tito was in the partisan uniform – the uniform from the period of the people’s liberation war (later named also socialist revolution) in which Tito’s role was unquestionable. Secondly, in the beginning of 1968, there was an initiative to name the University of Belgrade by Tito’s name – so one of the reasons we named it the ‘Red University – Karl Marx’ was to prevent the implementation of this initiative! 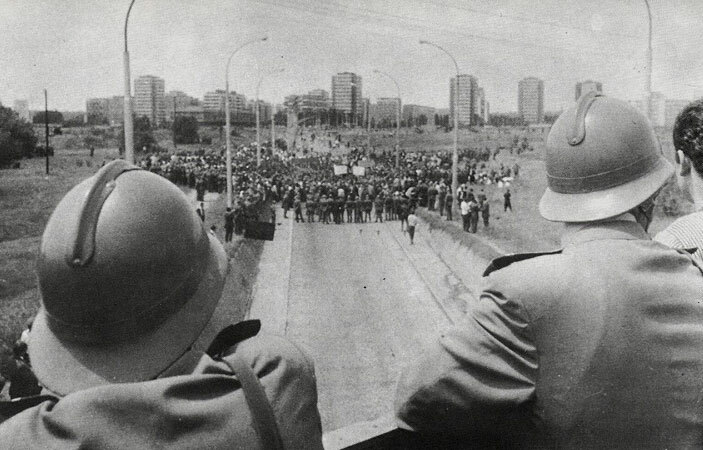 Can we say that what we saw in Belgrade for a few days in June 1968 was the beginning of a kind of revolution that was stopped before it was fully articulated? Or perhaps it was just a revolt, lead basically by students, a strong movement but limited? 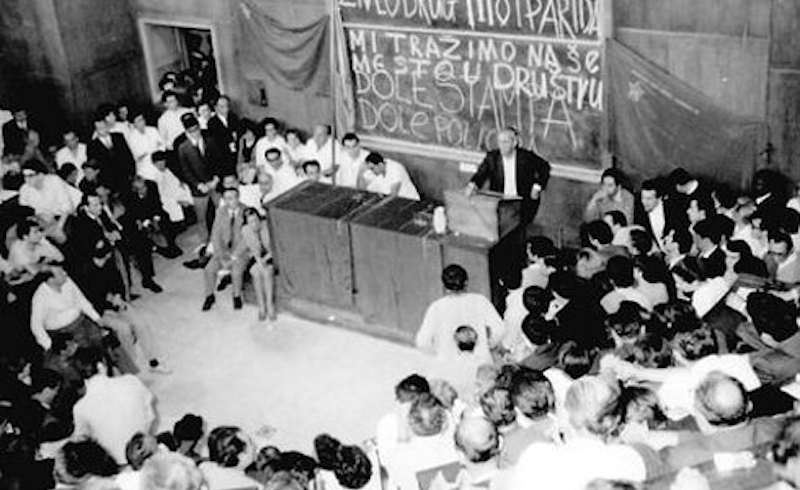 I would not say that the ‘June movements’ in Belgrade and across Yugoslavia were a strong but limited student protest – that can be seen from the direction and content of the struggle, from the topics we opened up, from the social connections we established… student issues were the least important. Also, I would not say that the ‘June movements’ were the beginning of a revolution stopped before its final articulation – from our program documents – to repeat, 3+4 demands, the Resolution of the University of Belgrade and the Action Program – it can be seen that we clearly knew what we were doing and why, who our allies are in that struggle, whose allies we were. What were the major changes after the events of June 1968 on the political, economic, social, and cultural fronts in Yugoslavia? Looking from a short-term perspective, we won! We conquered culture, science, and art; we significantly influenced changes in the everyday life (not only at the individual level) and culture; from the ideological point of view, we delegitimized the system; we opened up a space for new social and art practices – for feminism, ecology, even conceptualism! Nothing was the same after 1968! Looking at it from a longer-term perspective, unfortunately, everything we fought against, and everything we were warning about that it will happen if politics did not change – is today a reality. And that is a ‘new’ reason for struggle, for the continuation of struggles! What would be your message for the youth of Serbia and in other former Yugoslav republics? From the point of view of eternity, I hope that (at least) one lesson will remain: Whenever there is a problem in front of a human, s/he will always find an original, fresh and new, effective way to solve it! Or, concretely: socialism is indispensable only if it is wished for, thought about, and continuously worked upon. Let the struggle be continuous!